Following the recession of the last ice age, Squamish’s famous landmark emerged during this extraordinary eruptions of fire and ice occurring with the Pacific plates sliding and the water and ice surging around a former volcano. Mount Garibaldi stands today over looking the town of Squamish and the old magma chamber of this volcano which remains is known as The Stawamus Chief, the world’s second largest granite monolith. Professional climbers have brought the area great national and international attention. Along with the growth of Whistler Ski Resort approximately one hour’s drive north. Squamish also treasures another well portrayed landmark, which is sought out by photographers, leisure sailors and painters, is the Howe Sound. Dramatic in a morning’s mist, luminescent at dusk and a boater’s delight in the sunshine, this popular setting is part of the scenic Squamish daily lifestyle, adventure and cultural past. 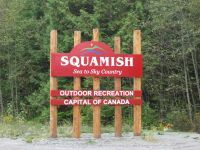 Squamish boasts the title as the "Outdoor Recreation Capital of Canada", which is quite a statement considering that one could easily pass through the small town it were not for its bold landmarks and hill side highway views into the heart of the town. Yet, it seems the shared community will and natural attributes strongly support and environment that offers (almost) limitless outdoor recreation year round! The first human inhabitants arriving after the ice age would have appeared here over 5,000 years ago. The Sko-mish, or “Squamish” First Nations tribes were supported by the rich forested living and dense abundance of land and water fresh food sources. During the voyage of Captain George Vancouver, in the 1700’s, the crew would discover many of British Columbia’s shorelines (islands and the mainland). In June of 1792, they would arrive at Darrell Bay, in Howe Sound, just south of Squamish. By 1889, farming families and gold rush adventures had become familiar with the area in passage or to settle. As families settled they grew dairy farms in nearby Brakendale. Forestry took over soon after and became the areas base economy. After the railway in 1956 and Sea-to-Sky Highway were complete Squamish was no longer solely dependant on transportation of goods or products by sea. Wet West Coastal Rainforest rainfall occurs periodically during the Fall and Spring keeping the area lush green. Winter may have periods of snowfall at sea level, however the majority of snowfall keeps to the higher elevations, which can be seen on the nearby mountain peaks.